I knew this was Nederlands on first glance. How glorious spring is in that part of the country after the typically dreary, cold winters. The story behind "Dutch farm with Tulip fields"
One of the things most foreign people know about the Netherlands is that loads of cheese and flowers are produced here. I love the fields of tulips in all colours that we have here in spring. Normally all flowers bloom end of April, but this year had the warmest winter in recorded history and halfway through April, most flowers were already cut as the bulbs are the valuable part. 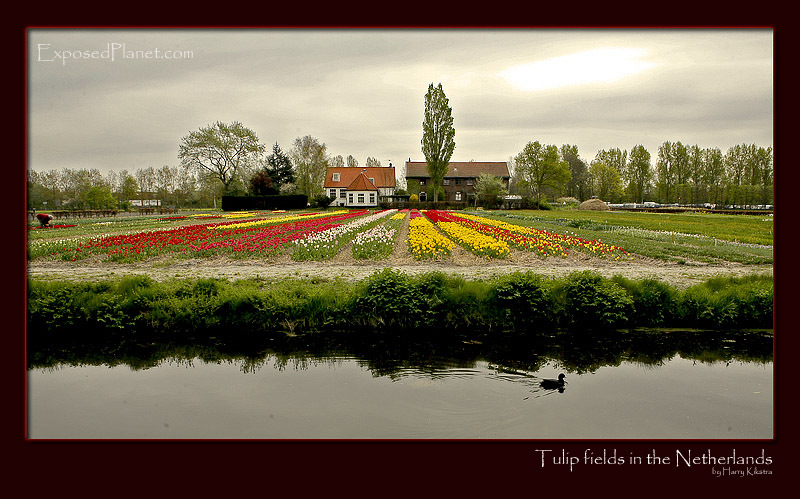 This is a small field near the small place called Lisse, home of the renowned Keukenhof, the openair exposition of flowers. This is already an example of the field that colour the Lowlands every spring. Normally these rows are much fuller and much bigger, this is just a small Tulip field. I will post a few close-ups of the different types of tulips next days to let you celebrate the real spring!